I made it with a participant list. It is sending mail to this list members. I am clicking Approve, and then the outcome is being "Approved" for me but the other members' outcomes are still blank and the task is not finishing. How to do this? Could it be that you still need two more approvals for the document? Document approval could be set to All at once (in parallel) so there are three approval tasks. One is completed, two remain. You could try changing this to 'Serial' instead if you would rather tasks are only set one at a time, in a chain. It is also worth checking to see if Expand Groups is ticked - if it is, then an approval task will be set to each member of an approval group. As you see in the picture below, I have two approval groups instead of people; when active, the Expand Groups setting assigns a task to each group member. 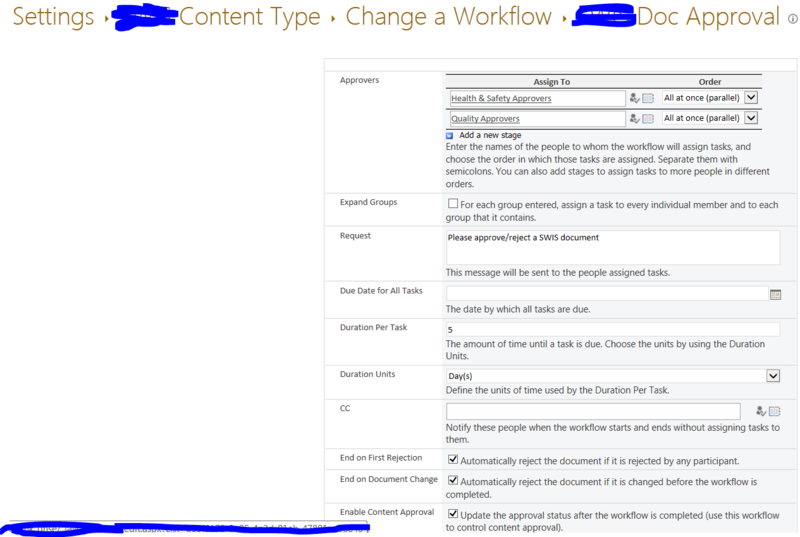 If it is not active then a single person from a group can approve the document on behalf of the group. Not the answer you're looking for? Browse other questions tagged workflow designer-workflow approval-process content-approval or ask your own question. Why is setting task fields in a “Before A Task Is Assigned” step not working?